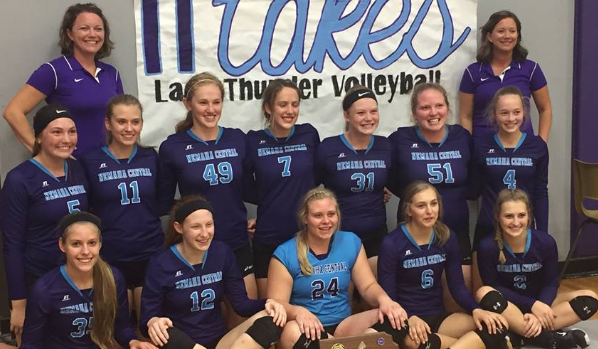 Not a lot of prep action is going on in August with zero varsity football games in Northeast Kansas coverage area but off to a hot start in 2017 is the Nemaha Central Volleyball team who get the Rainbow Communications Northeast Kansas Athlete(s) of the Month for their big start in 2017. Seneca and Baileyville are no stranger to a lot of success in all of the sports over the years but volleyball is one that has shined for a while. The Thunder, ranked seventh in 3A in the latest KVA rankings, started off the month of August with a 7-1 record with victories over Valley Heights (2-0), Marysville (2-1), Hanover (2-0), Royal Valley (2-0), Riley County (2-0), Holton twice (2-0). They have improved to 15-1 over the first couple of weeks of September this month with their only loss coming to Concordia back on 8/26/17. NC is also undefeated in league play at 4-0. The Thunder feature 6-foot-1 outside hitter Laura Macke, a second team KVA all-state pick last season, who has comitted to play basketball at Kansas State. Only two matches for the Thunder have went to the third set this season and they have won 10 matches in a row. Nemaha Central is led by head coach Jessica Koch, who was the 2013 1A KVA Coach of the Year in Kansas at Baileyville B&B. Nemaha Central has never won a volleyball title however there's a ton of success on what puts this newly consolidated school as a volleyball power. Nemaha Valley last won a title in 1996 and Baileyville B&B last won a title in 2013 before the two schools consolidated to form Nemaha Central. Seneca is no stranger to volleyball titles as Nemaha Valley won seven state titles from 1988-to-1996. Baileyville B&B won four titles as a school before closing including a three-peat from 2011-to-2013. Congrats to NC from Rainbow Communications on earning this invidivual honor as a team this month for their performance so far to start the 2017 season. They will be back in action next Tuesday against Hiawatha on the road.